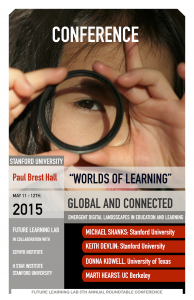 Here is a note on the upcoming Spring Roundtable on the globalization of learning, hosted by Future Learning Lab, HStar Institute Stanford University and Zephyr Institute in Palo Alto. The Roundtable will ideally organize between 50 100 people from Silicon Valley and invited guests. The event is booked for a Stanford venue, but we are still keeping a small opening for change of days – since we still hope to get a commercial sponsor for the event. As it now looks, the plenary session will be hosted by Oddgeir Tveiten and Matt Bowman. A number of keynotes will be given in rapid sequence, with a follow up Q/A roundtable discussion, which we hope to stream and otherwise make available. Keynoters will be: Keith Devlin, Michael Shanks, Donna Kidwell and marti Hearst. Keith Devlin is co-founder of the H Star Institute at Stanford University and an associate of Future Learning Lab since 2011. Michael Shanks is professor of Archeology at Stanford University and a long-time associate with the D School. Donna Kidwell is professor at St. Edwards University in Texas, President of Webstudent International and also a long-time associate of the Future Learning Lab. Professor Marti Hearst specializes in new technologies and learning, from her vantage point as professor at the Department of information Science, UC Berkeley. Oddgeir Tveiten is co-founder of Future Learning Lab – as professor of media studies and journalism studies at two university institutions in Norway. Matt Bowman is co-founder of EdSurge, and now recently also the Zephyr Institute in Palo Alto. More information on the speakers and Roundtable will be posted.